Note that the California HSR system would be contained within the state of California, and well less than the full length of the state, so this freight would be competing with short and medium distance trucking rather than competing with long distance trucking. 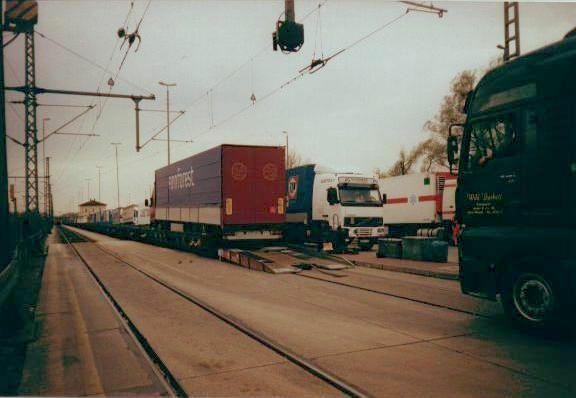 For short and medium distance freight, European rail operators occasionally use a Cargo Sprinter type train. An electric version, with a generator trailer for operating in a marshaling yard, would substantially reduce marshaling delays per consist. I think it is great to allow light cargo on the system, even during the regular span of hours for passengers service.... so long as passenger service is not affected. But, I am of the opinion that the statement made by the CHSRA will need to be revisited. Specifically, the applicability of running trains during non passenger service hours. If BART is an applicable example, they do not run trains 24/7 because they need a reliable window of time for maintenance in the ROW. That time is during the middle of the night. BART systemis large, but the CHSRA system would be much larger. Certainly some track maintence, even inspection, needs to occur on a regular weekly and nightly basis. I suspect the CHSRA making that statment was to appease interests, whereever or whome ever they were, that cargo was a possibility and mute or tone down their opposition for the time being. California is a large state with a large population. It's probably a viable market for high speed cargo and rapid freight in its own right. Long-distance interstate rail freight will always be important because of the ports, but there may be plenty of in-state business opportunities if speed and flexibility are improved. The CargoSprinter is another good example, through it relies on a modern rail network that can handle axle loads higher than 17 tons at intermediate speeds. That means track with some superelevation, geometry databases, PTC infrastructure etc. Wear and tear of the rails and trackbed is proportional to the fourth power of axle load, same as for roads. One locomotive with four axles at 22 tons each will do as much damage as 3 cars that stay under the limit for high-speed lines. Running even medium freight will drastically increase infrastructure maintenance costs, rendering high-speed passenger service that relies on speeds of up to 220mph unprofitable. There's a reason most of the European network is rated at or below 200km/h (125mph) and, it's not just because of curve radii. The US has spent the last 50 years disinvesting in its rail infrastructure and it shows. In the near term, I doubt the CargoSprinter concept would be technically feasible in California, even if someone could make a business case for it. BART doesn't need to do track maintenance every night. For inspection of the state of good repair of the track and catenary infrastructure, the Japanese use a small fleet of special test trains called Dr. Yellow. If CHSRA decides it wants to allow operators to run some trains at night, that doesn't mean they'll be allowed to run all night, every night. There will be scheduled maintenance blackouts, just as there are for every other 24/7 system (e.g. data centers). The main sticking point for exploiting the infrastructure at night isn't maintenance, it's noise. @ Rafael ... just noting the distinctive market segments being talked about here ... even Sacramento / San Diego would not normally be considered long haul trucking. That'd be more approaching 1,000 miles and up. On the CargoSprinter mode ... to be more explicit, with a phrase like "an electric version of the CargoSprinter concept", the concept I referred to is the short consist, push-me-pull-me single stack container train, with automatic couplers for running in longer trains that can be quickly assembled and disassembled. Lower axle loadings would require setting an appropriate maximum gross weight per container. Since shipping charges in these market segments tend to be set by the weight-mile, the system is already in place in most warehouse operations to monitor weight loaded per container. If the CAHSR system is to be used for freight, monitoring of axle loads at freight access points would be needed in any event. And if there is an electric bus in the auto-coupler, then attaching a generator trailor to take a consist out from under the wires would be a straightforward operation. I think a distinction should be made between cargo and freight. Freight is much heavier compared to cargo, correct? Because of the loads expected with freight, freight does not seem compatible at all on the HSR network; too slow and affects infrastructure too much... affecting tolerances needed for HSR. No one needs a bumpy ride at 220mph! Lighter cargo, on the other hand, appears much more compatible.... assuming the conveyance does not affect scheduled passenger services. Good work furthering thought on inspection and maintenance and compatibility with non-passenger services. I am not sold yet on the solution, but I am not a decision maker with the CHSRA either! I look forward to additional coverage on this as the system progresses and policies get vetted... likely learned about in the media, but here too. Hypothetically speaking, if fulltime staff/labor committed to inspection and mainteance are not needed for the network ROW... I can see that work occuring by contract to a 3rd party. And, the staff/labor of that 3rd party could maximize their own effeciency by working on track networks of other systems while not needed on CHSRA. In fact, UPRR or BNSF may be contracted to maintain CHSRA ROW. Or vice versa. The possibility of these options seems more possible with maintenance staff being based at regional locations than a single centralized place. Cargo is goods carried by a large vehicle ... truck, train, ship, barge, airplane. So is freight. Freight comes in heavy or bulk freight, medium freight, and light freight. Light freight is certainly compatible with the limit on axle loadings for a freight car on the HSR network, heavy freight is certainly incompatible, and there would be a dividing line somewhere with medium freight. The heavier the weight overheads per axle, the lower the ceiling would be on the tare weight. Isn't a standard 40' container already limited to 30 tons, so that with two axles to a container it'd be under 17 tons/axle? UPRR and BNSF have zero expertise in maintaining high speed lines. However, it's quite possible that infrastructure maintenance will be outsourced via a long-term maintenance contract to (California subsidiary of) the specialized vendor whose technology is chosen for the construction of the line. Something similar may apply for trainset maintenance. you have to count the weight of the flatbed car incl. the trucks as well, not just the payload. Such cars usually have four axles, so with a single container the whole thing might be under the limit. The locomotive probably wouldn't be. As BruceMcF indicated, running a moderate number of medium freight trains is a grey area. In Europe, it wouldn't even be considered because the rest of the network can handle that application. I picked TOFC as an example because it is better suited to rapid horizontal transshipment. Shipping containers have to be lifted with a crane.